Ladies, if you are looking for a waterproof Jacket that is made to fit you and perform while putting your bike through the test both on and off-road, take a look at the Alpinestars Stella Vence Drystar Jacket! This jacket has it all! From protecting you from the elements to protecting you from the trails and roads, the Stella Vence Drystar Jacket has you covered. The DRYSTAR lining will keep you dry, the thermal liner will keep you warm, and the CE certified shoulder and elbow armor will help keep you safe. 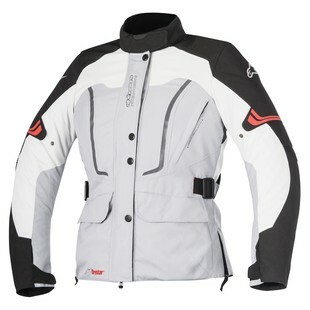 A great feature of this jacket is the option to add in the Alpinestars Nucleon Chest Pads for added protection. The waist adjustment and accordion stretch inserts on the elbows help make this jacket comfortable enough to put down some major miles on some fire trails. If you are looking for a jacket that can keep up with you on your next adventure, the Stella Vence Drystar Jacket might just be it!